There's no better way to get and enjoy the good things in life than to wait for it. Patience pays is a popular phrase. (Gee, that rhymes!) I believe there is a time and moment for everything, even when we absolutely hate not getting things just when we want them. There's a whole system of things created by nature (or God) and, perhaps you won't realize it but, what you receive after a long wait is always worth it. It's better for you. Therefore, if you feel restless about not getting the job you want (like I have been feeling since months, hence, lack of posts here), all you have to do is to close your eyes, breathe deeply, feel grateful for what you have, look at its positives, and keep striving to do your best. Never lose hope. Good things come in good time. Carrying on the last point, good things usually come at just the right time. They may take ages or come sooner than expected; whatever is happening right now is the perfect thing for the present time. You are learning to not only control your anger/irritability issues while not getting your dream job, but also realizing the realities of life and how to deal with those. While you are always hopeful that your dream life is possible, you will realize that it takes a great deal of bravery and relentless work to get it. Good things will come in due course, though being optimistic about it will hasten things, so stay positive! When they've come to you, nothing in the world can take them away, except time. I know some people who refrain from sharing good news, perhaps imagining that someone will steal it from them! My dears, that is just not possible. Good things can only be shared and multiplied, not divided. If you have a certain advantage, you have it. Period. Don't be scared of having that taken away from you. Unless it is an Apple device you carelessly leave lying around. ... so that you don't even realize that what is happening is a good (or great) thing! They're not always obvious, apparent or even feel goody; they sometimes come nicely wrapped in layers of packaging, but you will realize them when they do their work (that is, help you get something great!). Maybe not getting through one of the big companies was actually a good thing and not the end of the world as you saw it (OK, I should stop making indirect references to myself). But really, things, even though they may not seem like good things, sometimes are actually good. 5. Good things can happen suddenly! Anyway, the answer is that I had been facing one of the worst possible times (even though you might think I made it worse by overthinking, but I really couldn't help it). It was just emotionally draining as I was filled with insecurity and uncertainty of the highest order: the kind where nothing anyone says seems to make you feel optimistic unless some 'good thing' happens. Even reading did not appeal to me, so you can guess how weird it made me feel. I am thankful to family and those friends who supported me despite my apparent lack of regard for their words, who believed in me when I didn't. There were four of us. 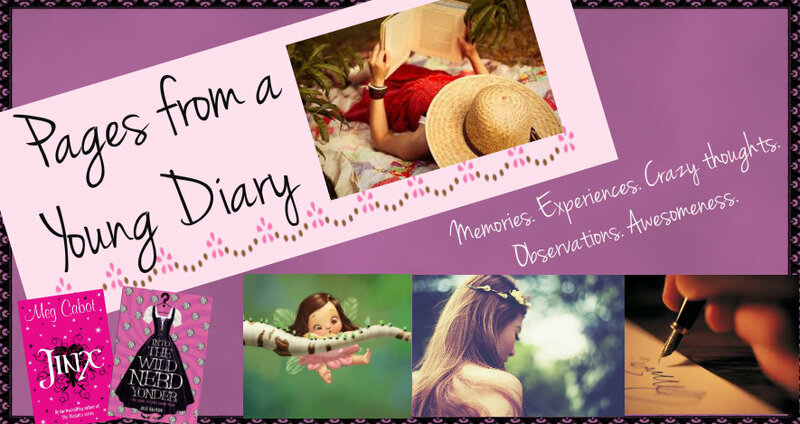 We had planned a three-day trip to Mussoorie, the lovely hill station above Dehradun. I had only been there once, many years ago, when I was an awkward teenager and all I remembered about the trip was killing exotic insects in the summer house we were staying in, getting bitten by a Scorpion plant, walking a steep slope to get water, and lots of stomach cramps. This time it was as if I'd never been there before! We checked in a heritage hotel where we got a free upgrade to the deluxe quarter!! We spent our two days exploring the Mall Road right above the hotel, eating from popular eateries, dancing and gossiping and playing cards in the comfortable room, and of course, clicking awesomesauce pictures. The hotel overlooked Dehradun valley and the views were spectacular. The pleasantly cold weather (the November in Delhi kind) was a big plus in keeping us upbeat. Decidedly, the best part of the trip for me was getting a chance to meet the fabled writer of the hills, Mr Ruskin Bond!! Oh God, it was one of the best things I've experienced, even though I totally sucked at interacting with him. I asked no smart questions that I usually do with authors (probably because I was still in that bad phase mode, but still!! ), only smiled and spoke a few words in greeting and got my copies signed. Ruskin Bond is precisely how I'd heard he is. A jovial-looking man of eighty, he arrived at Cambridge Book Depot a little after 3.30 PM on Saturday, smiling at everyone he passed. There was a long line of people waiting to see him, the best of whom were little children reciting poems to their parents for practice. I got really lucky when he arrived just as I was making payment for a book, and standing right next to his seat. He greeted everyone as he entered the small shop, including me (YAY! ), and sat down, commenting on the line of people waiting to see him. I've met some authors at book signings, and found all of them quite humble and sweet. Mr Bond was the best of all! He accepted all forms of gifts (including poems and stories written by kids), and joked and talked with all his fans as they stepped up to meet him one by one. If you've read his books, you'd know the kind of person he would be, and when you see the soft and kind-looking face, all you feel like doing is smiling and making a witty joke (which, most probably, would not occur to you at that moment). 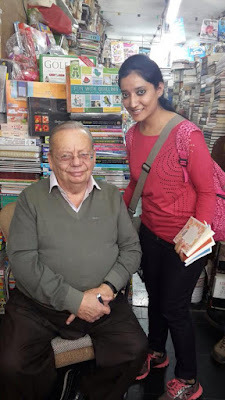 One of my great friends, P, took a great picture of me with Mr Ruskin Bond, and I am forever grateful to her for gifting me this proof. I also apologize for not taking as great a picture of her as she did for me. The trip was a success. We'll plan another one soon! ;) The next good thing that seems like a disguise was a job offer from a place I wasn't much preferring, but talking to a few people cleared my head and now I feel great about it. I have an opportunity to work for my dreams, and if it seems difficult, that's all the better, as I would be motivated to work even harder. A couple more things on the family front turned awesome, and I am glad about it all. I only hope that the good thing in disguise really becomes good and the positives outweigh the negatives. Hiya! Thank you for reading and leaving such a lovely comment (as always). It was indeed a delightful thing! :D Life is good! delightful read with an even more delightful pic with Sir Bond....! Even i wish to meet ruskin bond!